It was a Roman baths, crossed with Paxton’s Crystal Palace in London, crossed with a Parisian Market Hall and an exhibition pavilion. 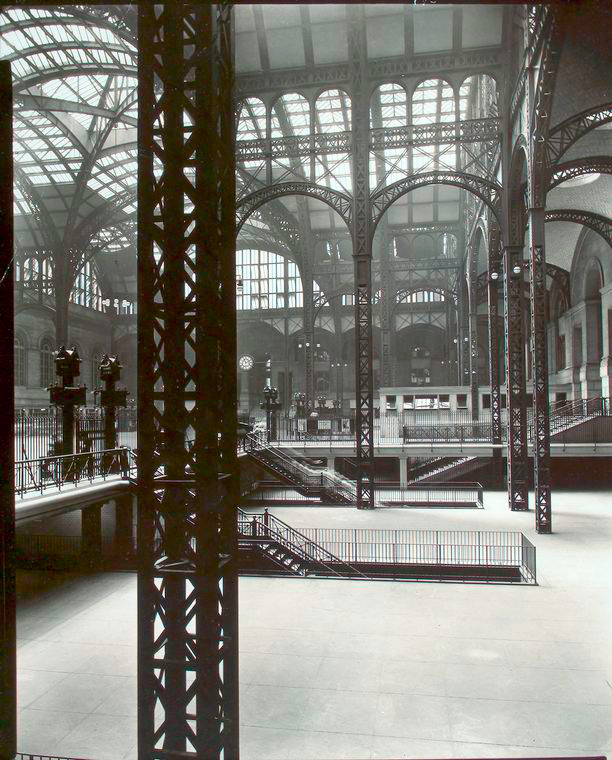 It was an iron, steel and glass palace in its own right, possibly the most majestic railway station ever built¹. It’s hard to disagree with the sentiment, which makes it all the more saddening that New York’s Pennsylvania Station has been lost to us forever. If you study transport history for any length of time you will encounter two lost railway buildings which galvanised the transport heritage movement in their host countries. In the UK, it was the Euston Arch, the demolition of which in 1961-62 led directly to an organised movement to save nearby St Pancras Station and the Midland Grand Hotel, which were also under threat. In the USA, it was Penn Station, the loss of which energised local people to prevent the demolition of Grand Central Terminal. To these lost buildings, we owe the survival of those which remain. 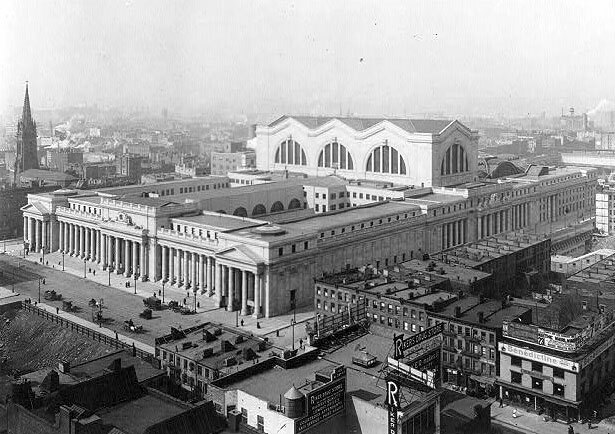 Built by the Pennsylvania Railroad Company in 1910, Penn Station lasted for only 53 years before its demolition and replacement with the claustrophobic underground station which resides on its site today. British readers unfamiliar with the current Penn Station, but familiar with Birmingham’s 1960s New Street Station (currently being rebuilt, I’m glad to say) will have some idea what it’s like, except I can assure you that Penn Station is even worse. Occupying four entire blocks of New York city, between 31st and 33rd Streets, and Seventh and Eighth Avenues, Penn Station was a powerful addition to the cityscape. 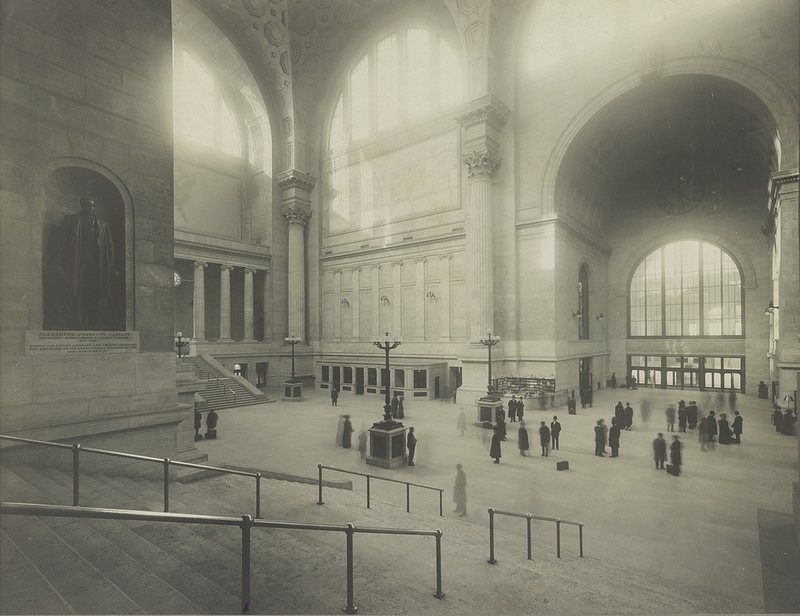 Designed by McKim, Mead & White, like Grand Central Terminal it was a Beaux Arts building referencing Classical architecture, but applying a contemporary idiom, especially within the glass and steel concourse. What it lacked in height in that city of skyscrapers (apparently there was an argument over whether to build a hotel on top of it or not) it more than made up for in visual impact. Its two long side elevations on 31st and 33rd Streets were less ornate, but still impressive, and its bright finish contrasted with the smoke-darkened buildings surrounding it, as you can see from the following view. The building was actually finished in pink granite (see here), which must have been quite a sight. This picture also illustrates the main elements of the station. Behind the main entrance was a long avenue, lined with shops (the Pennsylvania Railroad was as business-savvy as any modern airport operator which forces you to walk past endless shopping opportunities on your way between security and your departure gate). The avenue led into the main waiting room – the tall part of the building with the large lunettes. Beyond that was the main concourse, the arch of its glass roof just visible behind the concourse structure in the picture above. It is interesting to note that although the external facades are very Classical in appearance, the internal walls, which can’t be seen from the street, are of a much more modern appearance. Like Grand Central Terminal, Penn Station was designed as an electric station. The Pennsylvania Railroad had originally terminated on the west side of the Hudson River, which was an unsatisfactory distance away from Manhattan, the heart of New York City proper, which was reached by transfer onto a ferry. Commercially practicable electric locomotives which became available at the beginning of the 20th Century allowed the Pennsylvania Railroad to enter Manhattan with a tunnel under the Hudson. Steam locomotives would have created too much smoke in a long tunnel. The Pennsylvania Railroad continued onwards at the other side of Penn Station, under the East River, linking to the Long Island Railroad. 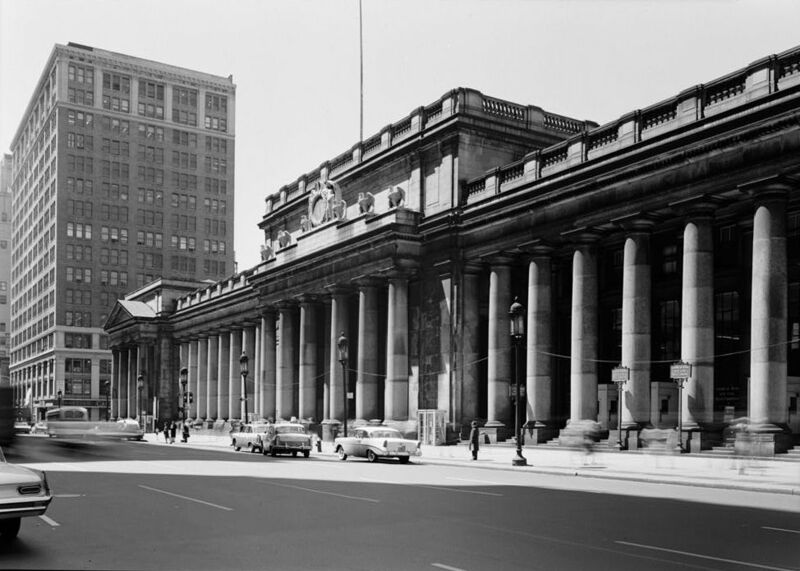 This made Penn Station a ‘station’ because trains ran through it, as opposed to Grand Central which is, by American railroad definitions, a ‘terminal’: the end of the line, a place at which trains can go no further. Lunette windows at high level allowed plenty of natural light into this extremely lofty space, and while the form of the room might have been inspired by the Baths of Diocletian, the octagonal coffers on the ceiling are a direct lift from the Basilica of Maxentius and Constantine (see a picture, here). The wide staircase from where this photo was taken leads down from the avenue of shops. 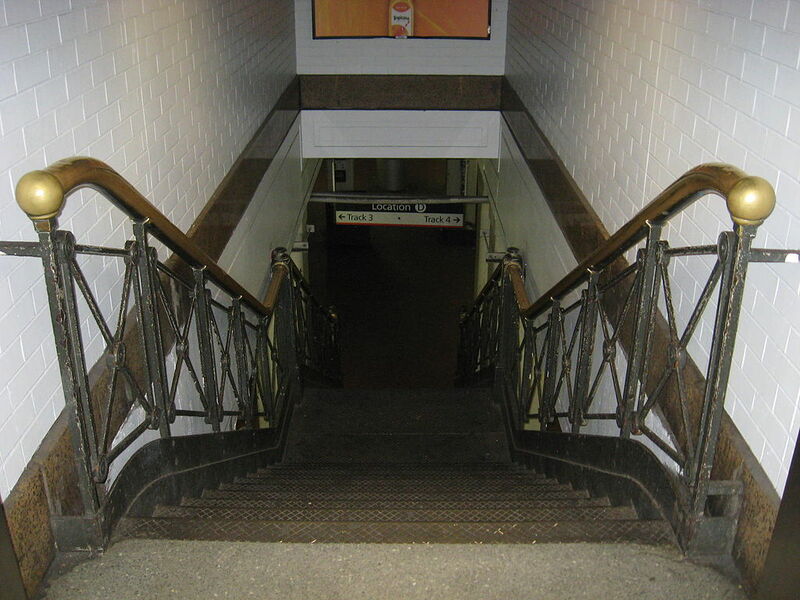 Smaller staircases on either side of the waiting room led up to 31st Street (the one in the distance on the left of the picture) and 33rd street. 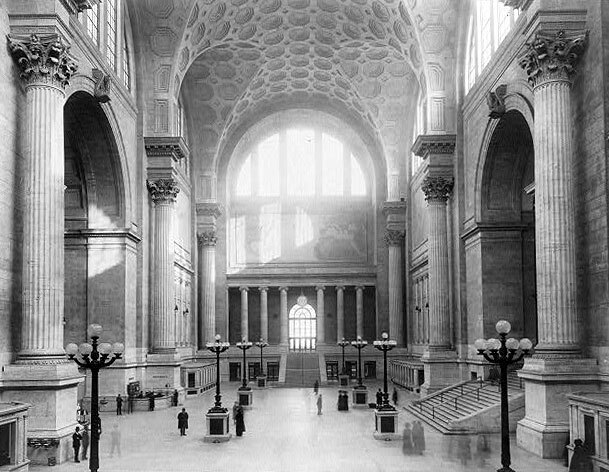 Its interiors clad in travertine marble (see here), this was a station as bright, clean and modern as the Pennsylvania Railroad wanted its train services to be perceived as being, but one which drew on the great architecture of the past to lay claim to a tradition of civilisation. This, in other words, was transport as betterment for the soul. Such an aspiration might seem near laughable today, especially when we’re stuck in a poorly designed airport terminal, or dingy bus or railway station. But this was an era to be proud of mass transportation, rather than embarrassed by it. Within people’s living memories, industrial transport had literally transformed the world in a way few other industries before or since have ever managed. Penn Station was that sense of achievement, put into stone. At least, mostly into stone. Because through the large archway on the right of this photo was Penn Station’s main concourse. With its truss columns and ribs, and glass roof, Glancey’s comparison with the Crystal Palace is entirely apt. Penn Station’s concourse shared the same tall, airy feel, and the marking out of space by the steel columns was also very similar. Cross vaulted again, it shared to some extent its form with the waiting room, but the concourse was a much more modern and industrial-feeling space. It was the Pennsylvania Railroad’s modernity and technological prowess in built form. The concourse was a complicated multi-level structure, with the actual platforms some distance below, reached by brass and wrought-iron staircases. The patterns created by the criss-crossing steel work as it ran through the multiple levels, were quite marvelous. It wasn’t to everyone’s taste, of course. Architecture critic Ada Louise Huxtable said (see here) that the, “complexity and ambiguity of its train levels and entrances and exits were a constant frustration…it was a better expression of ancient Rome than 20th-century America.” She did say nicer things about it later though. The station thrived at first, but by the 1950s, a steady decline in passenger railroad traffic made it increasingly uneconomic to operate. Its architecture wasn’t particularly well treated either. The insertion of an escalator into the middle of the staircase leading down from the avenue and into the waiting room was just about acceptable. A hideous set of new ticket desks in the waiting room, covered by a dreadful corrugated roof which was hung from one of the internal walls was certainly not (there’s a picture showing both changes here). But those abuses were all about to be rendered moot. 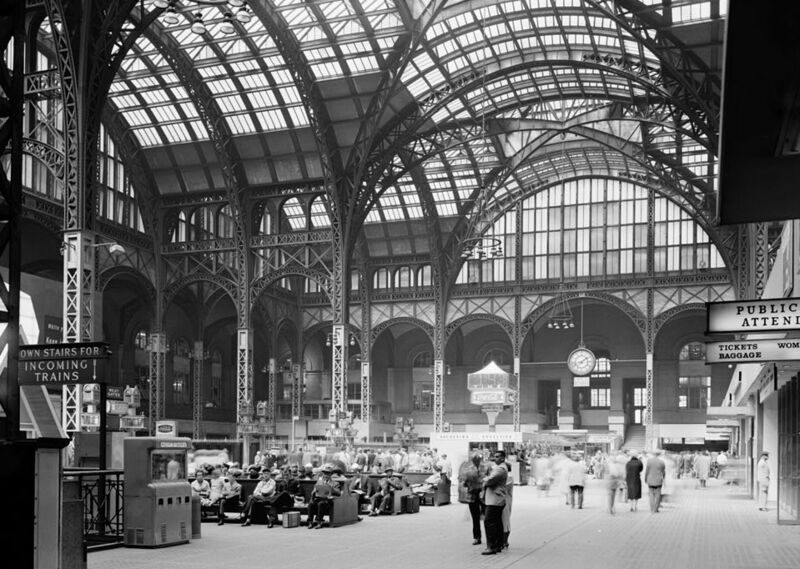 In the early 1960s, the Pennsylvania Railroad reached a deal to sell the air rights above the station, to allow the construction of the current Madison Square Gardens. The extraordinary surface buildings all had to go. There was no legal means for protestors against the demolition to prevent it, and the station was gone by the end of 1963. The Landmarks Preservation Commission was set up in the wake of its loss, and was instrumental in saving Grand Central Terminal. Very little of the old Penn Station remains. There are a few bits of masonry here and there if you know where to look, and some statues were saved (the New York Times ran an article on the subject in 2003, here). The most notable survivor is a single example of the brass and wrought iron staircases which led down to the platforms. You can’t. It’s been demolished. Click here to see where it was, a site currently occupied by Madison Square Gardens, under which is the current Penn Station. ² I wish I was so knowledgeable about the world’s architecture. Sadly not. This relationship is mentioned in: Jones, Denna (2014) Architecture: the Whole Story, Thames & Hudson: London. Anyway, Arch Daily (here) reckons it was the Baths of Caracalla. A number of other sources are linked to in the text of the article. I’ve read all of those too, and some information has been re-used from them.